Amber Wake: Gabriel Falling Update! 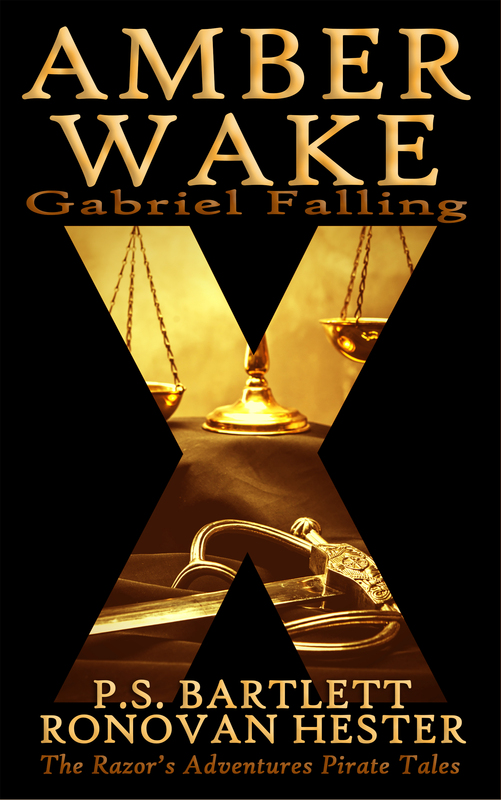 It’s time for an Amber Wake: Gabriel Falling update! We keep selling and people keep reviewing. Unfortunately, they don’t all end up on Amazon.com or Goodreads. However, for those that are on those sites, we have 5 unique 5 Star Reviews, and 2 unique 4 Star Reviews. With one of those 4 Stars noting she rated it a 4.5. I’ll take it! Here’s just a taste of a few. Now, I want to warn you… this is not your typical pirate tale! It’s BETTER!-5 Star Review from blogger, and aspiring author. 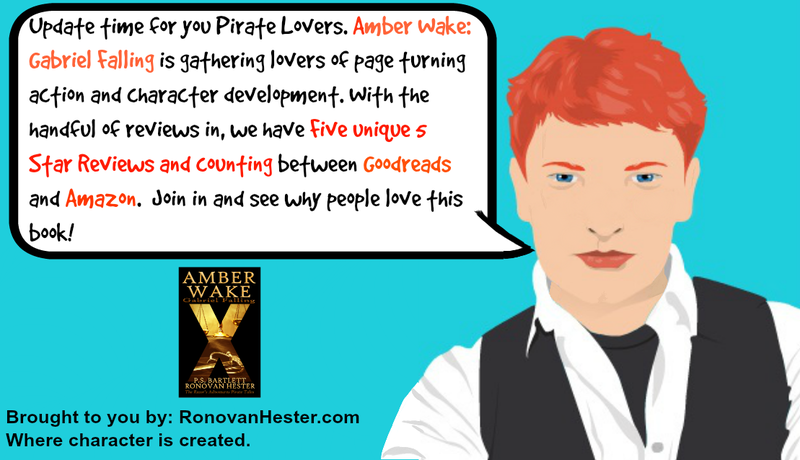 “I thoroughly enjoyed Amber Wake and the set of circumstances that brought Royal Navy Captain Gabriel Wallace to find himself a reluctant pirate. When I said this was not your typical pirate tale, I wasn’t kidding. This seafaring tale is really the study of a man finding himself in a situation where his quick wits and sense of right and wrong lead you on a rollicking good adventure. The captain is clearly the star of the book and you get a clear sense of his internal struggle where he is obliged to reveal the darkness that lurks within himself. I loved the depth that each of the characters portrayed. I was able to step inside of their minds and live the story through their eyes. History came alive and showed the chivalry this group of men possessed not only for the crew but for others as well. A Fun and Fast Read.–4 Star Review from traditionally published author. “What I found when I began reading was immediate engrossment in the cleanly written character of Captain Wallace, who is a seafaring man of high rank, with a conscious. That his first person voice is as confessional as it is kept me turning the pages. There is a humanness to Captain Wallace that the reader is privy to via his internal monologues, and this is what kept me engaged with this fast paced, undulating story of a man falsely accused by the English court, who then takes to the sea with a cast of supportive characters. A Story to Fall in Love With-5 Star Review from bestselling author, and radio show host. Marvellous book – intense emotions, intrigue and suspense!–5 Star Review from lawyer, professor, and therapist. “Amber Wakes is a story of change and one man’s transformation, telling the tale of one Gabriel Wallace, captain of the Royal Navy, an educated and honourable man. Captain Gabriel Wallace is a man with a moral code that is largely unwavering; a confident man who holds himself with pride yet humble. A romantic hero for sure! Totally unpredictable and a real gem of a discovery – Highly Recommended from aspiring writer and blogger. “… I must say it is such a catching and intriguing storyline. It is set around the classic storyline of a hero trying to right a wrong done to him but it is so much more than that…As a reader, you truly get caught up in the need for Captain Wallace to take down Admiral Chambers and all that he corrupts. With drama leaping off the first page, it gets its hook into you straight away. A page-turner from start to finish. I adore historical fiction novels anyway, but I must say Amber Wake’s storyline is excellent and unlike anything I have read before. I don’t know much about the British Royal navy (and maybe that made it all the more intriguing to me), but felt I could easily have lived through each setting from the British courtroom, the American Colonies, Caribbean ports, and, of course, the ships themselves. Oh, and my father who is in his 80s and isn’t into historical fiction of the Royal Navy and Pirate genre says, “A good read. I am wondering how you get Gabriel out of his current predicament.” From him, that’s praise. Get your copy today, and add to the list!